After Wesley Snipes expressed his desire to work with Shah Rukh Khan, SRK reached out to Snipes by asking him to “say the time and place" and he "will be there to share the screen space”. Wesley Snipes, who is popular for his role of vampire hunter superhero, Blade, had talked about his love for Bollywood films and his wish to share screen space with Shah Rukh Khan. 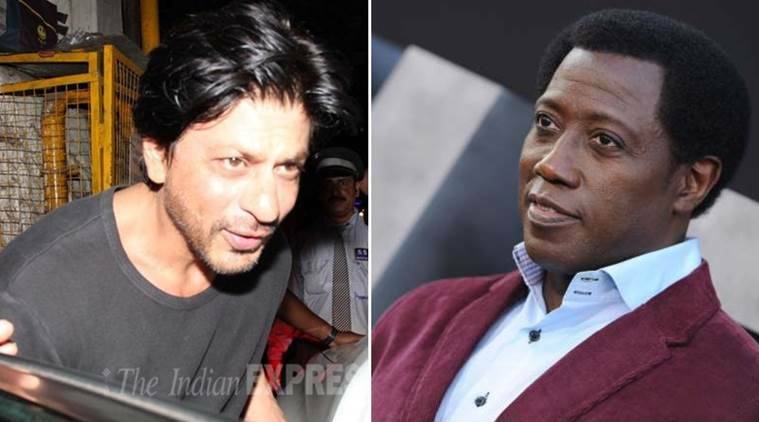 After American actor-producer-martial artist Wesley Snipes expressed his desire to work with Bollywood ‘Baadshah’ Shah Rukh Khan, the Hindi film superstar has reached out to the Hollywood star by asking him to “say the time and place” and he “will be there to share the screen space”. In an interaction with an Indian publication, Snipes, who is popular for his role of vampire hunter superhero, Blade, had talked about his love for Bollywood films and his wish to share screen space with Shah Rukh Khan, who has dominated the Hindi silver screen for over two decades. SRK, 49, then took to Twitter to confess that he is a fan of Snipes. “@wesleytsnipes whenever you say my friend. I am a fan… say the time and place I will be there to share screen space with the Blade,” Shah Rukh Khan tweeted. @wesleytsnipes whenever u say my friend. I am a fan….say the time & place I will be there to share screen space with the Blade!!! Meanwhile, Snipes is gearing up for his act as Mr. Johnson, a mysterious pit boss, in NBC’s thrilling drama “The Player”, which will air in the US and in India simultaneously. It will be aired in the US on September 24, and in India on September 25 on Colors Infinity channel.